Imec's EOG technology utilizes five dry-contact electrodes mounted on a standard pair of eyeglasses. The electrodes detect the eye-movement, while the ergonomic design gives the wearer the comfortable familiarity of every-day glass frames. It is less expensive and less bulky compared to state-of-the-art AR/VR headsets with eye-tracking capability. Moreover, imec's novel approach can achieve a sampling rate of 256 samples per second, making it more than twice as fast as current camera-based solutions for detecting eye position. Based on Bluetooth wireless technology, it is more energy efficient, requiring only one battery in a small box behind the wearer's ear. Another small box includes the electronics. Imec's EOG technology can be used in AR/VR applications to navigate interfaces and menus quickly by the user's eye gestures, eliminating the need for cumbersome hand controllers. An advanced algorithm translates the eye movement signals into virtual commands: lateral eye movements can for example be used to swipe and turn, while blinking will trigger a move forward. Moreover, eye movement analysis has been increasingly used in studies on neurological disorders, resulting in scientific evidence that eye movements are affected by neurodegenerative diseases such as Parkinson's disease or Alzheimer's disease, even at an early stage. With this in mind, imec aims to employ its technology for clinical research on the early detection of neurodegenerative diseases and monitoring disease progression. 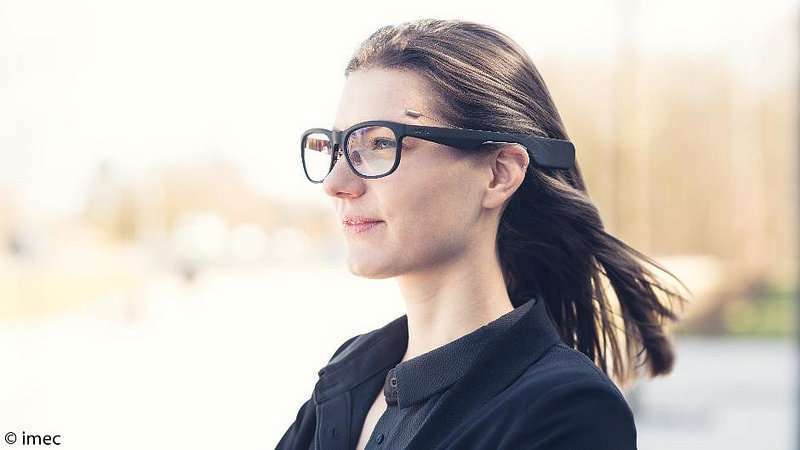 "The EOG glasses represent just one of many wearable devices that have come from imec research," added Alessio Meroni, project leader at imec in Holst Centre (the Netherlands). "Our constant mission is to leverage our semiconductor technology expertise to deliver innovative devices that can be worn as easily as the eyeglasses announced today. With our collaborative R&D model, we accomplish outstanding results in AR/VR, innovative healthcare and lifestyle technologies. We invite companies in the medical field to join our efforts to turn this technology into a valuable diagnostic tool." What on earth are "dry-contact electrodes" and how do they work. There is nothing in this article but fluff. You can do better I am sure.